What is the RDACC Regional Snapshot? The RDACC Regional Snapshot provides statistical analysis of a vast array of regional data to provide a concise economic, social, environmental and cultural description of the Region. 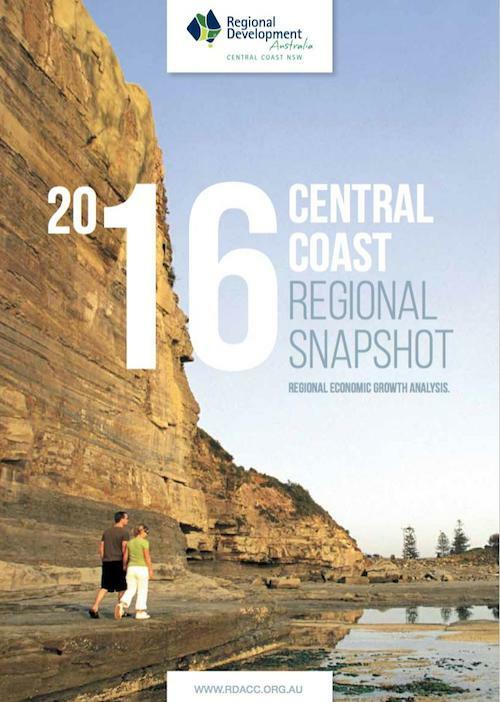 The Regional Snapshot also contains a high definition infrastructure map outlining the Agricultural, Commercial, Educational, Hospital/medical, Industrial, Parkland, Residential, Transport and Water areas of the Central Coast. Human Capital, particularly education and skills – Human capital is the stock of knowledge, expertise and abilities of a region. Sustainable Communities (economic, environmental and social) and population growth Sustainable communities refers to the ability of a region to endure in the long term. It has economic, environmental and social dimensions. Population growth refers to change in the size of a population over time, caused by migration and natural change through births and deaths. Access to international, national and regional markets. This refers to the ability to trade goods and services in a given market. Effective cross-sectoral and intergovernmental partnerships (including through place-based approaches) and integrated regional planning.